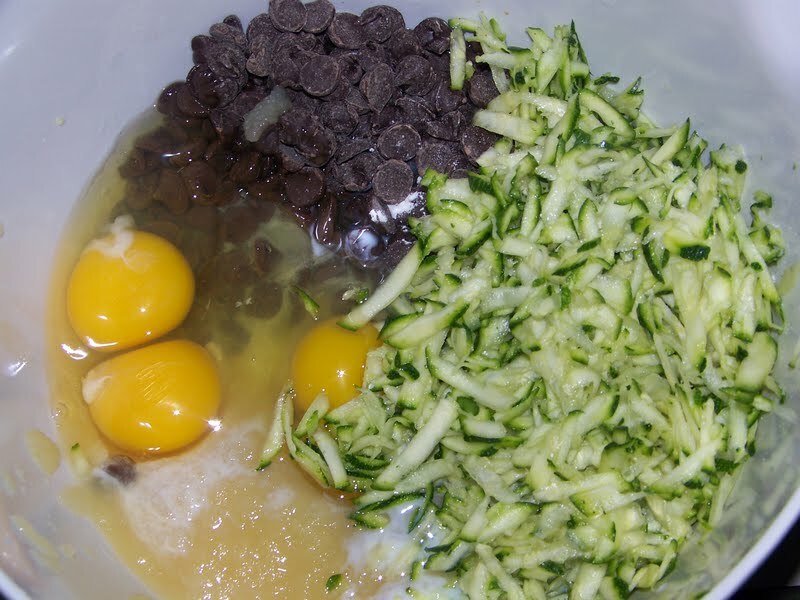 In May 2011, I wrote: My husband thought I was crazy when I said I was going to make a chocolate cake with 2 cups of fresh zucchini. He was hesitant, but he was also amazed when he tasted it and couldn't believe how good it was. 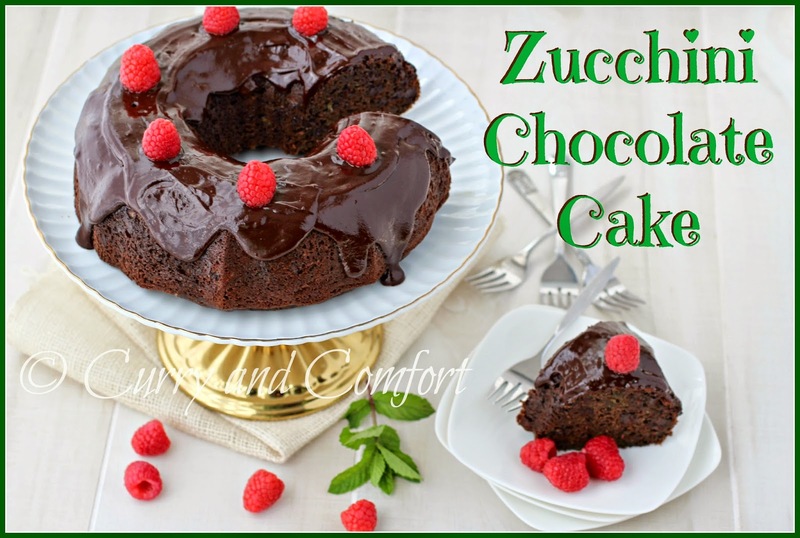 I love that this cake looks "devilish" on the outside, but has the the "goodness" of zucchini and applesauce on the inside. 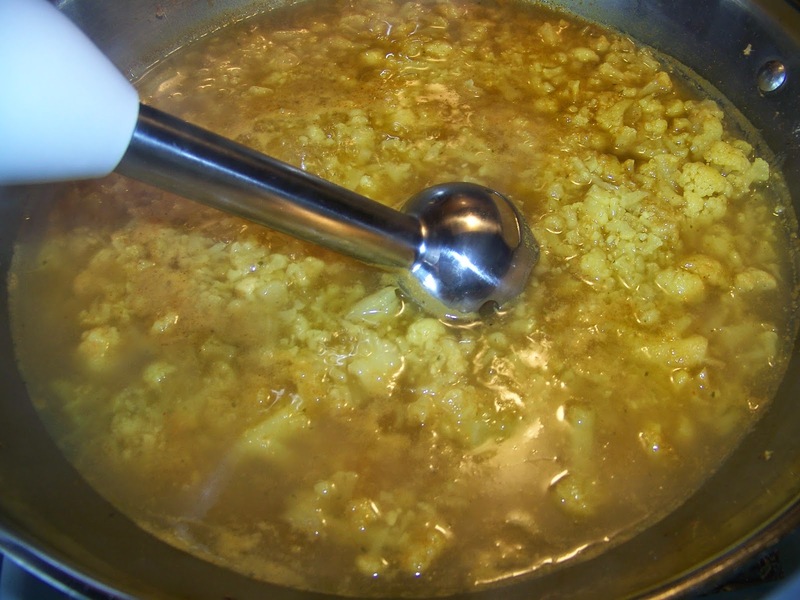 Gather all the wet ingredients in one bowl and mix together well. 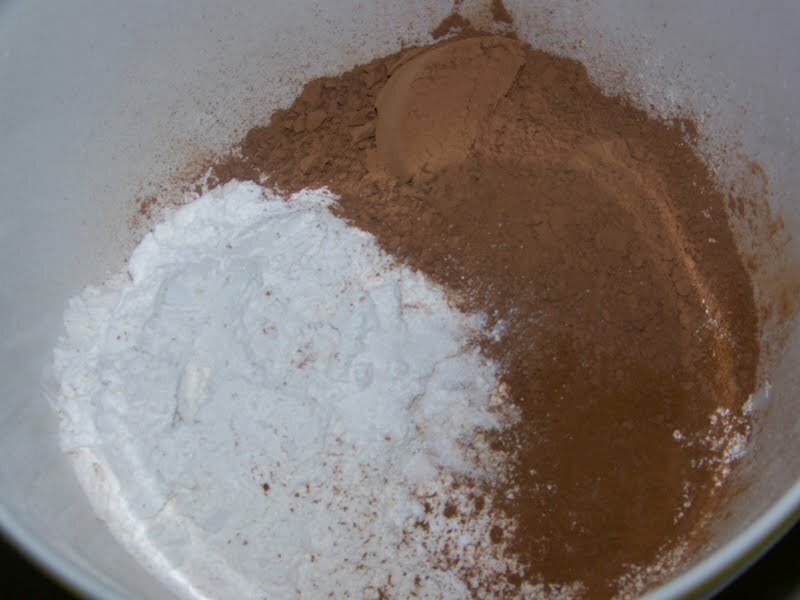 Place all the dry ingredients into a sifter and sift together as well as blend. 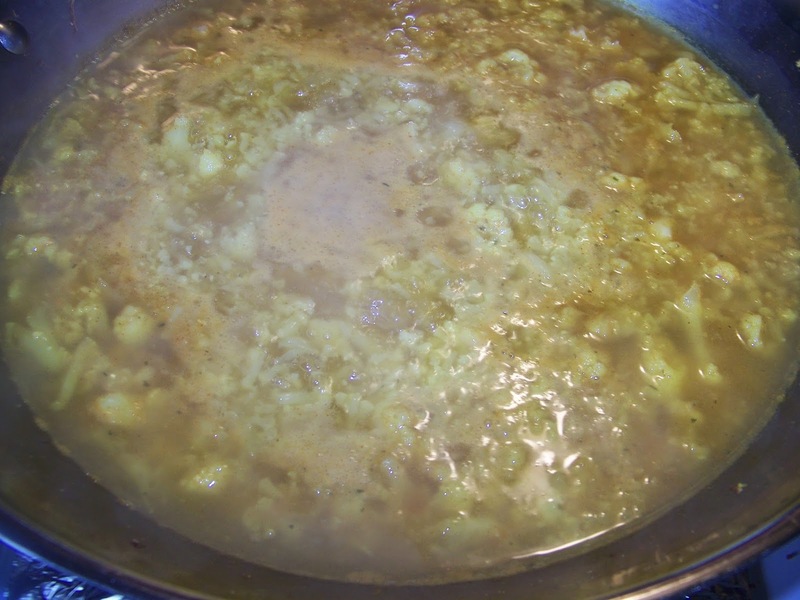 Next gently fold the dry ingredients into the wet ingredients a little at a time. Mix well, but do not over mix. 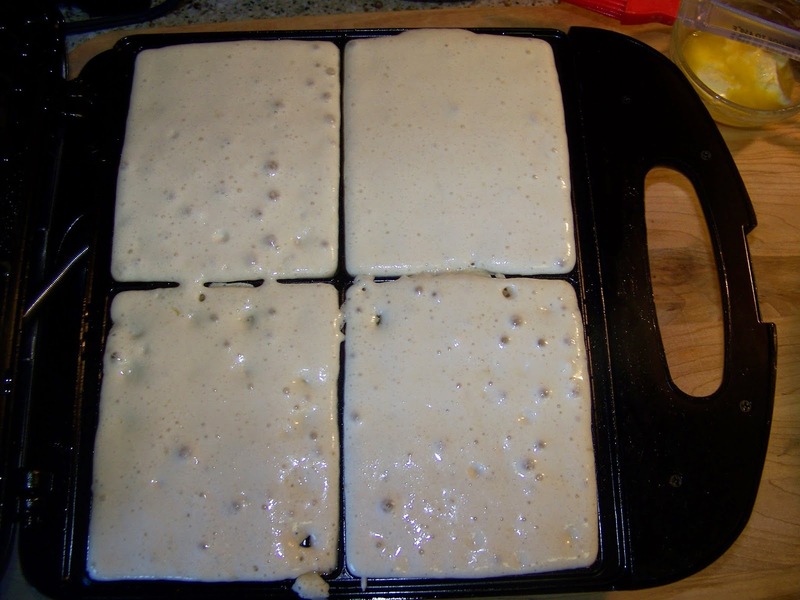 Pour into a well greased or sprayed pan. 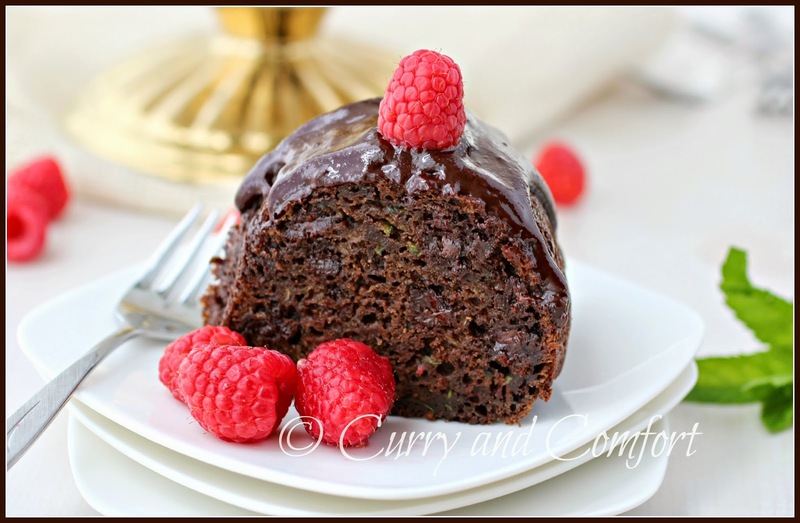 I used a bundt pan because it's my favorite. 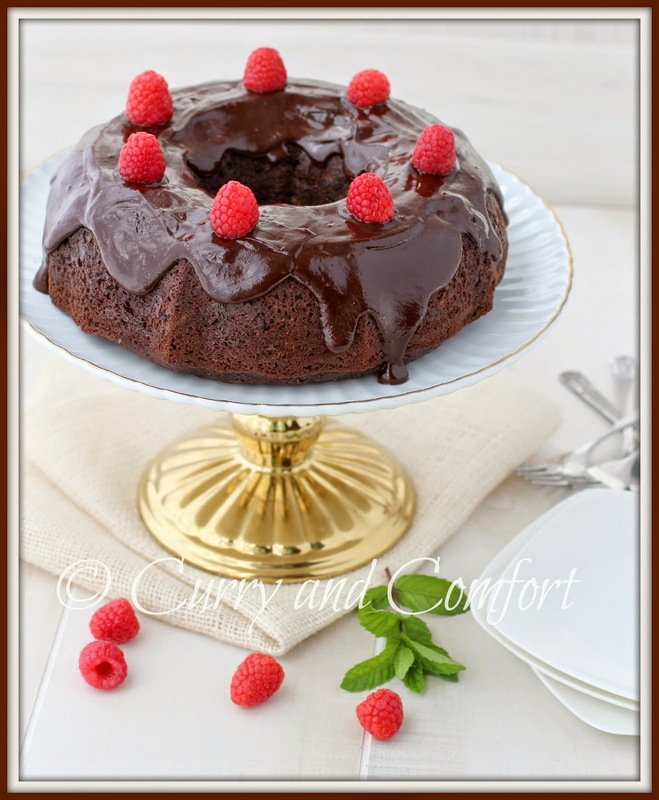 I baked the cake at 350 degrees for 50-55 minutes. Then tested in the center of the cake to make sure it was cooked fully. 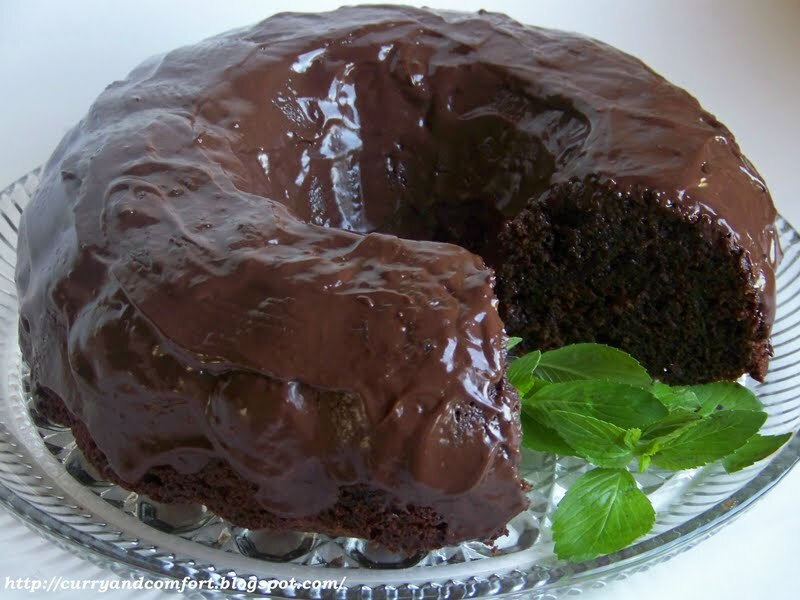 To frost/glaze the cake I melted 1 cup of chocolate chips in the microwave with 2-3 Tbs of whole milk. 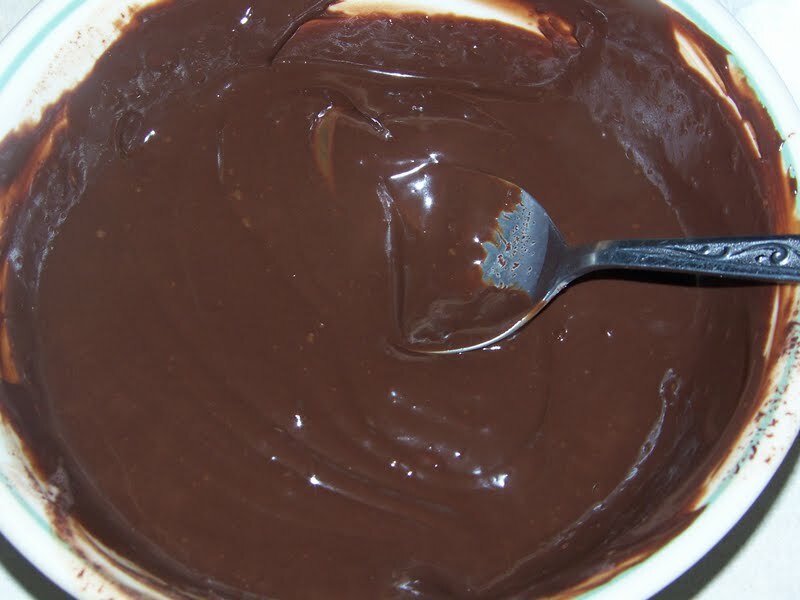 Stir well until it is a rich chocolate sauce that is still thick enough to pour over the cake. Cover the cake with the chocolate sauce completely. Garnish as you wish. Slice and serve. Refrigerate to store. Enjoy. The 2nd part to the fantastic Good Cook Kitchen Drawer Sweepstakes is about building your ultimate kitchen drawer. You can win 15 items you pick from loads of kitchen gadgets on goodcook.com. As a Good Cook Kitchen Expert, I was asked to build my ultimate15 item kitchen drawer. Good Cook as so many wonderful kitchen tools so I wanted to pick everything. Then I decided if I was building a ultimate kitchen drawer I would build it for my kids or first time cooks. My kids are at the age that they love helping me in the kitchen so having some items that help organize them during the cooking process would be essential. So the first items picked were the basic measuring cups and spoons. Then I decided I need the prep items like knifes, graters and prep bowls. Of course the knives I picked are not for the kids to use. Cooking with kids means a parent should be there throughout the process and help so all the cutting would be done by me (the parent). I finished off my drawer with cooking and serving items like spoons, whisks, spatula and ice cream scoop. Why the ice cream scoop... the easiest dessert that almost everyone loves is ice cream and kids are more than happy to end a meal with a big scoop of ice cream. I absolutely love this Good Cook ice cream scoop so I have two... one scoop for each hand. I was really pleased with my kitchen drawer and so were the kids. Then I talked to my kids about what they wanted to cook for the event. 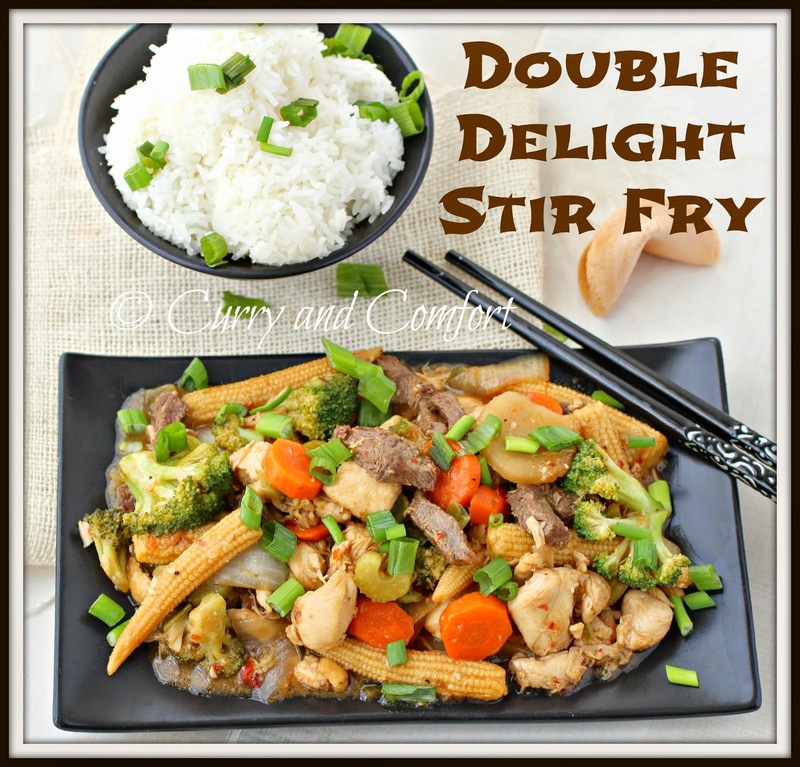 We picked a simple Chinese style stir fry, but my daughter wanted chicken and my son wanted beef. 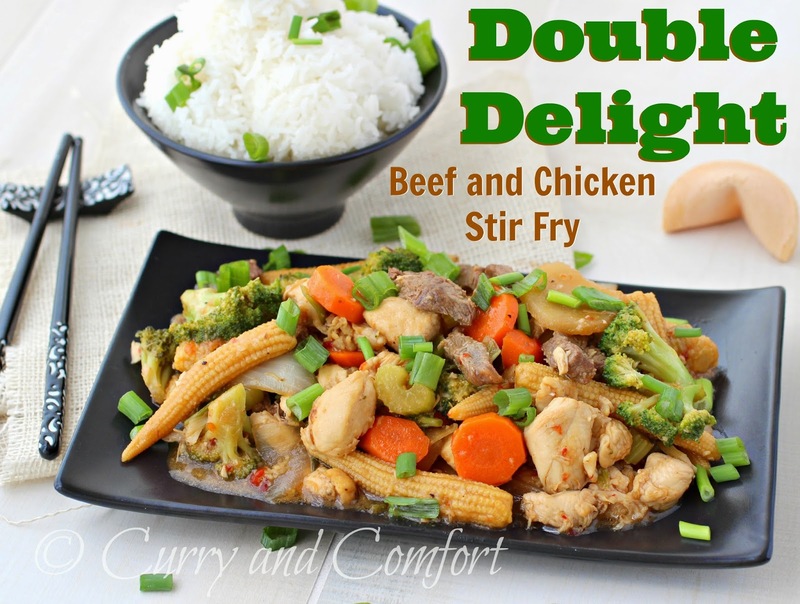 So I decided to double the fun by making this stir fry a double delight using both beef and chicken. I prepped all the vegetables and meat using the knives, but the kids did all the measuring and stir frying. 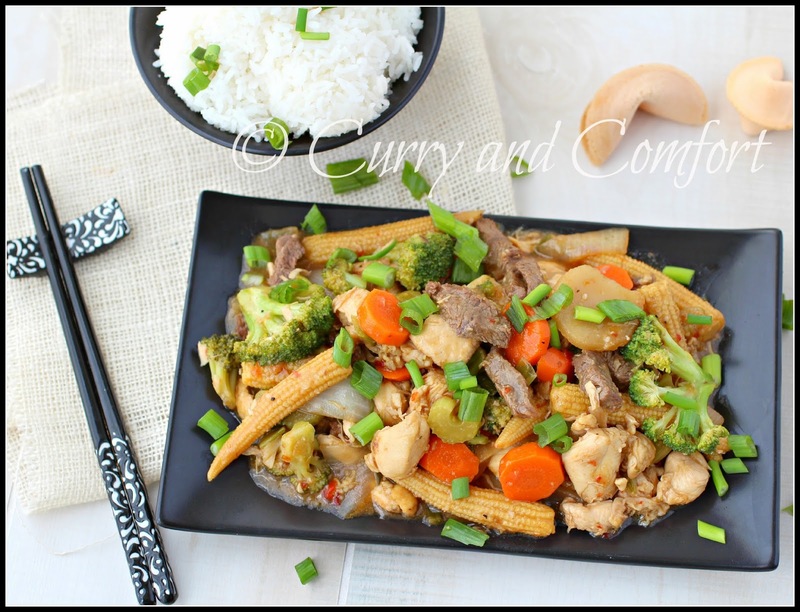 This stir fry was done in less than 30 minutes and we had a healthy dinner for everyone to enjoy. I hope my kids continue their love of cooking for the rest of their life. Prep all vegetables. Cut meat into slices or cubes and sprinkle with salt, pepper and cornstarch. Then toss until meat is all coated. Heat 2 Tbs canola oil in large wok. 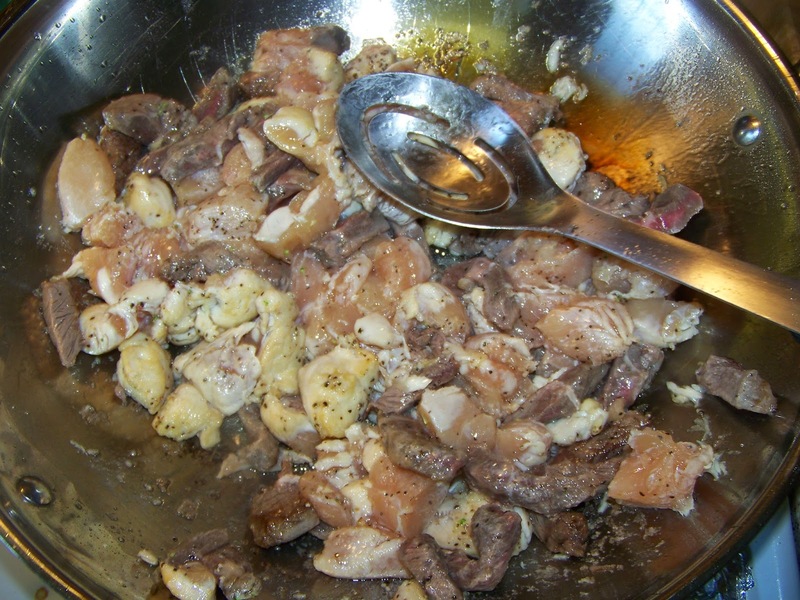 Fry meat (in batches) until browned. Then remove from pan onto a plate. 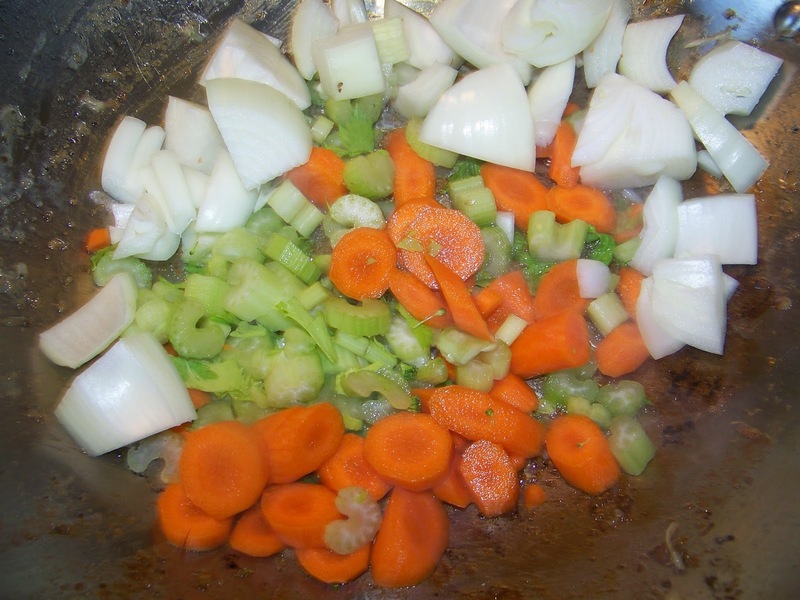 Once all meat is browned, add oil as needed and saute carrots, celery and onion. 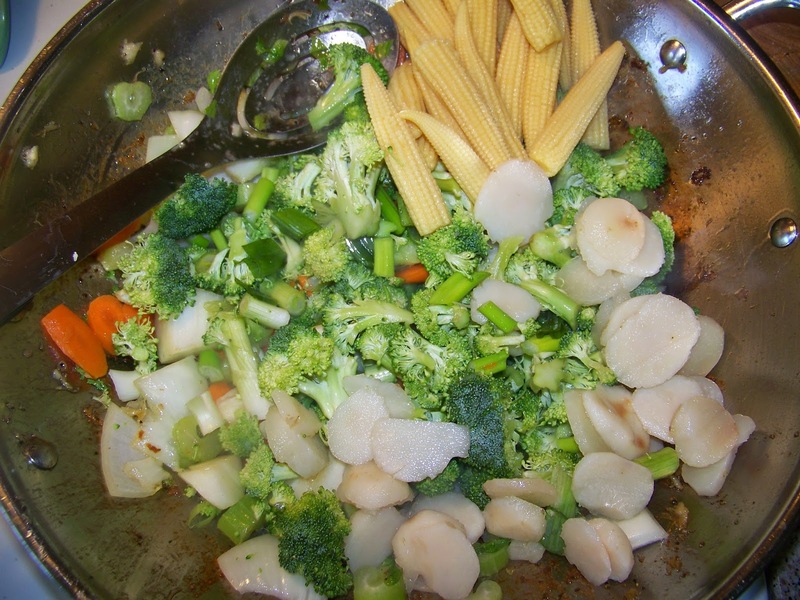 Grate ginger and garlic then mix all stir fry sauce ingredients. Set sauce aside until later. 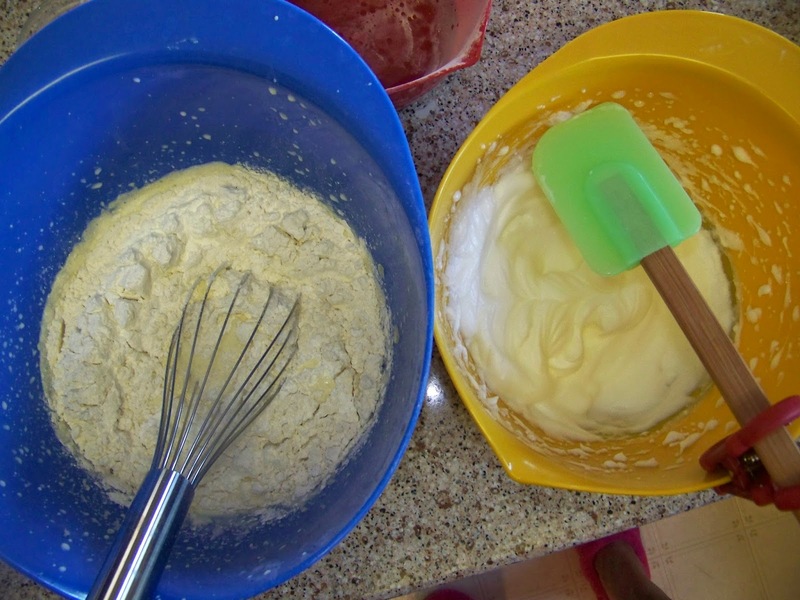 Also whisk together the cornstarch and water to make a slurry. 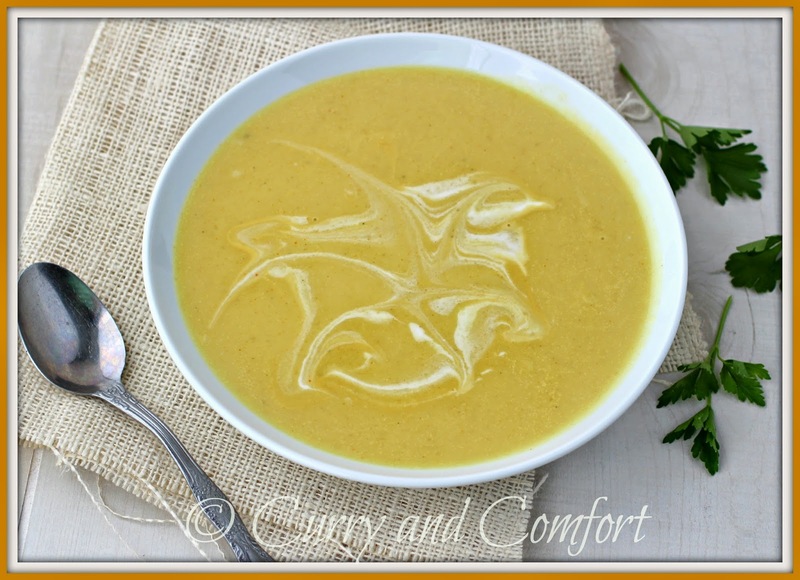 Make sure to whisk before using this slurry because the cornstarch will settle. 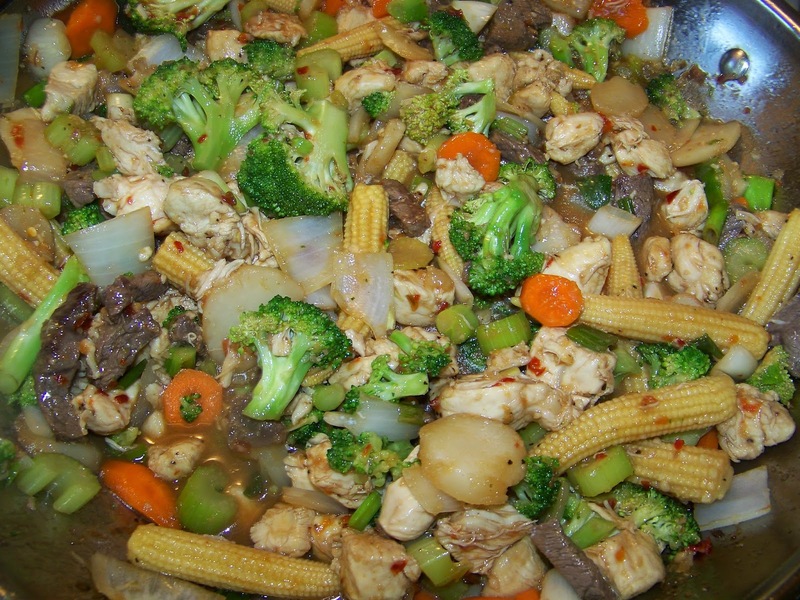 To the stir fry pan with the celery and carrots, add the softer and/or canned vegetables. 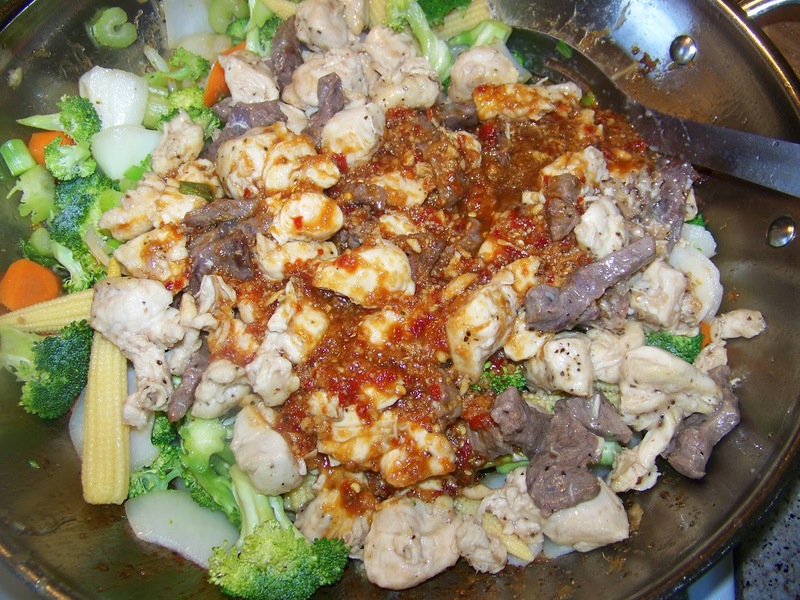 Then add the cooked meat and prepared stir fry sauce. 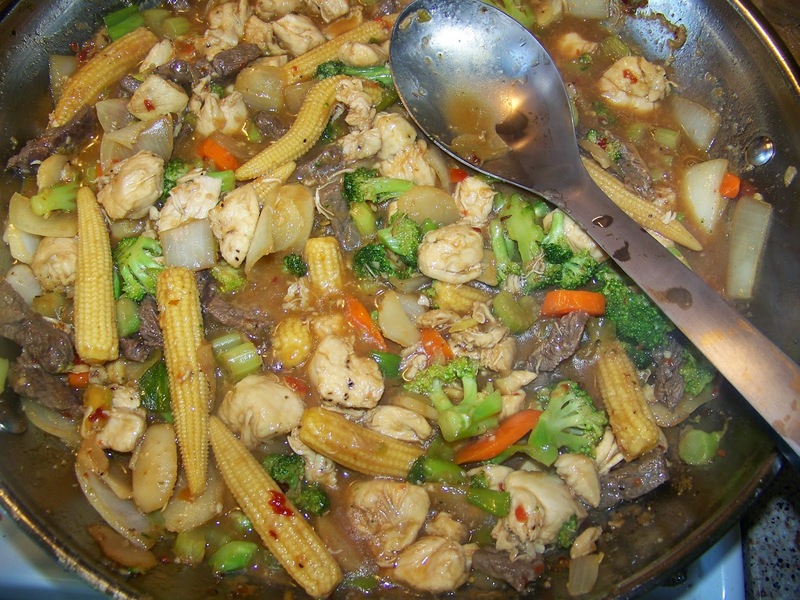 Cook stir fry in sauce for about 5 minutes. Finally add the cornstarch slurry to stir fry. Mix stir fry well and simmer for 2-3 minutes. Serve over cooked rice. Cook Jasmine rice until fluffy. 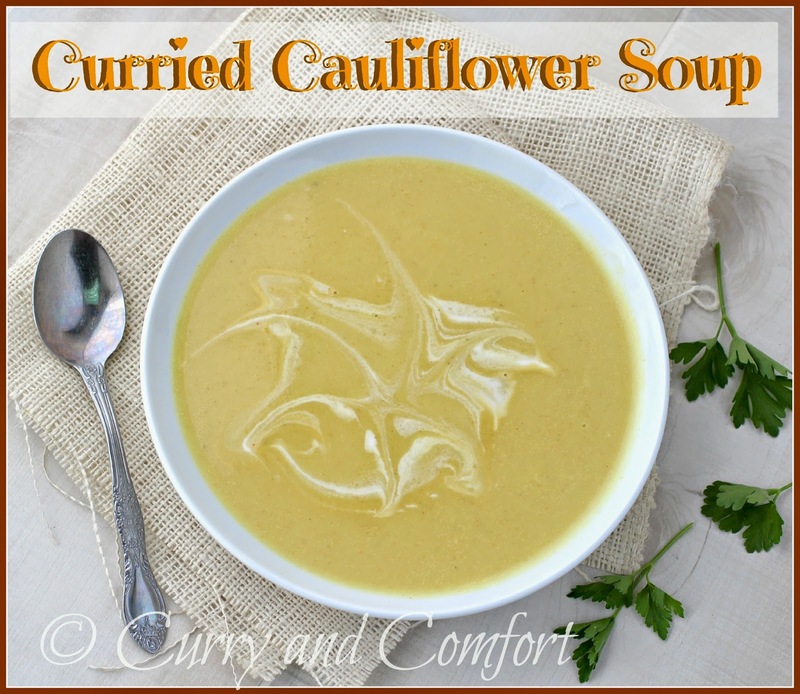 Serve with ice cream scoop for perfect portions. Enjoy. Measuring Cups, 5 Piece, Black-The kids wanted to make sure I cut exactly the right amount of carrots, celery and broccoli. These measuring cups are great to measure dry ingredients in baking as well. You get 5 sizes so it meets all you measuring dry good needs. Another plus, they are dishwasher safe. Measuring Spoons, 6pc. 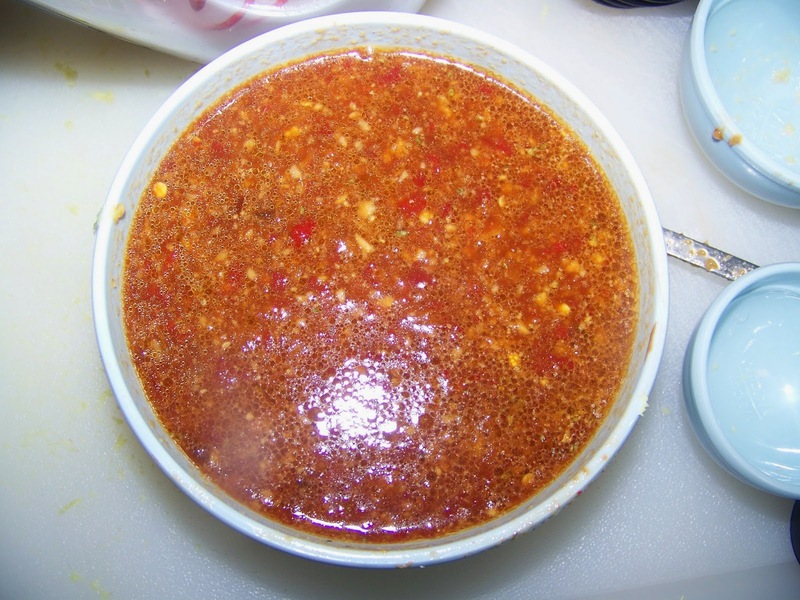 -The kids measured out all the small ingredients like the sambal, cornstarch and sesame oil. You get 6 sizes.. including the 1/8 measure which is not always in a measuring spoon set. I make a lot of dishes that need the 1/8 measure.. so this is very helpful. "Measure From Above" 3 Piece Liquid Measuring Cup Set -The kids were able to use these measuring cups to measure all the wet ingredients like the soy sauce and chicken broth. I loved that you get three very useful sizes. They are plastic so they are not heavy for small hands to hold. You can also see the measurements from above. 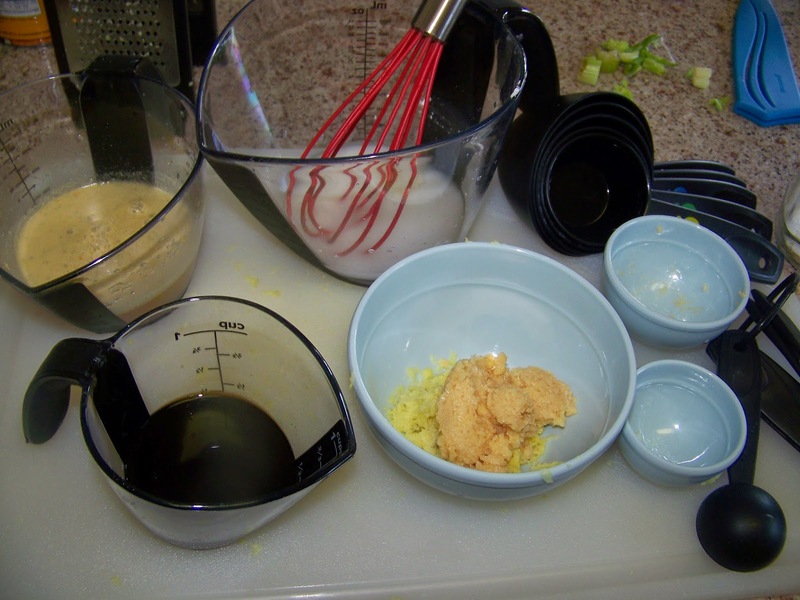 Prep Bowls, 5pc Set-We used the prep bowls to keep all the ingredients prepped and handy. We also made the Stir Fry sauce in the largest of these bowls. They are made out melamine so they are light weight. The only drawback is I wish they were dishwasher safe. Touch Stainless Steel Basting Spoon-We used this basting spoon actually as a serving spoon to make sure we got plenty of stir fry and sauce. I love the grip you get from this spoon... it's very comfort for little hands and even big hands to use. Stainless Steel Silicone Tip Locking Tongs, 12"-I love a pair of tongs. You can easily toss pasta or pick up items from a pan one by one. I actually used the tongs to help me plate my picture plate above. I wanted to make sure I got each of the stir fry ingredient so these tongs worked great. Nonstick Utility Knife-Knives are a must in cooking. Sharp knives are far safer to use than dull ones. These ceramic knives are beautifully sharp and comfortable to use. My kids are not yet prepared for using knives, so I handled this part of the cooking process. I used the small utility knife to cut my green onion tops as the garnish. Nonstick Santoku Knife, 5"-Knives are a must in cooking. Sharp knives are far safer to use than dull ones. These ceramic knives are beautifully sharp and I sailed through cutting up all the vegetables with ease. My kids are not yet prepared for using knives, so I handled this part of the cooking process. 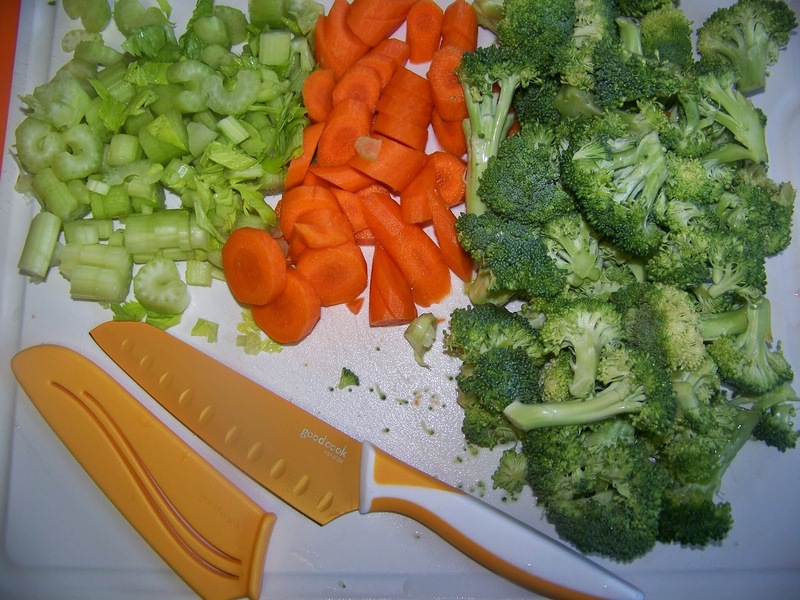 I used the santoku knife to cut cut all my vegetables for the stir fry. Nonstick Chef's Knife, 5"-Knives are a must in cooking. Sharp knives are far safer to use than dull ones. These ceramic knives are beautifully sharp and they literally cut through all my meat for the stir fry with ease. My kids are not yet prepared for using knives, so I handled this part of the cooking process. I used the Chef's Knife to cut all the meat for the stir fry. 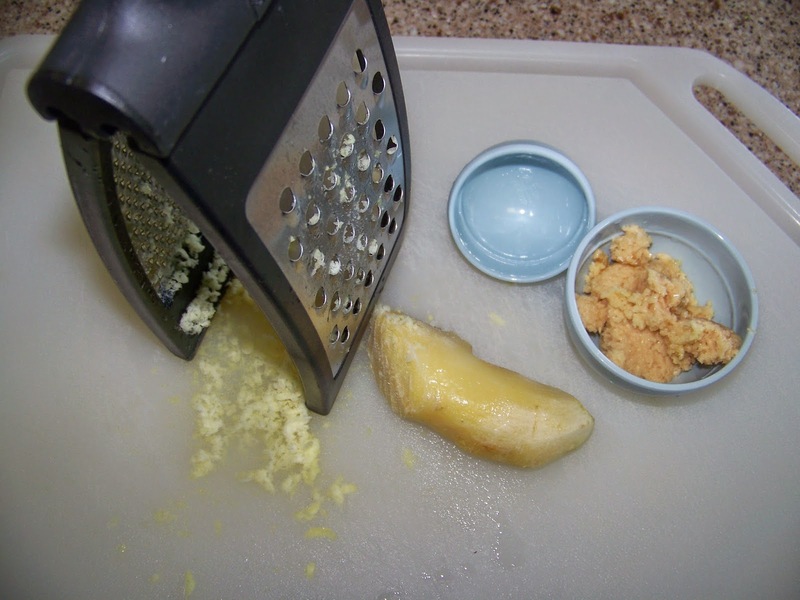 Folding Grater-My kids are not ready for knives, but they can use a grater. I carefully asked them to grate the garlic and ginger. 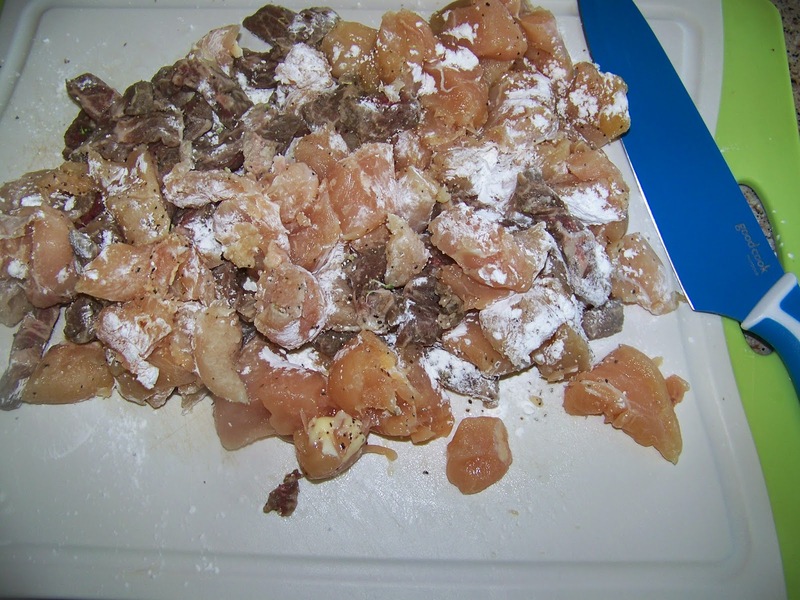 Here is a tip about ginger: clean and freeze ginger in freezer safe ziploc bags. Frozen ginger grates perfectly for stir fries and you don't get any large bites of ginger when eating. Silicone Whisk, 10", Red -My kids love to whisk things. This light weight silicone whisk worked perfectly to whisk the cornstarch and the water together as well as mix the stir fry sauce ingredients. 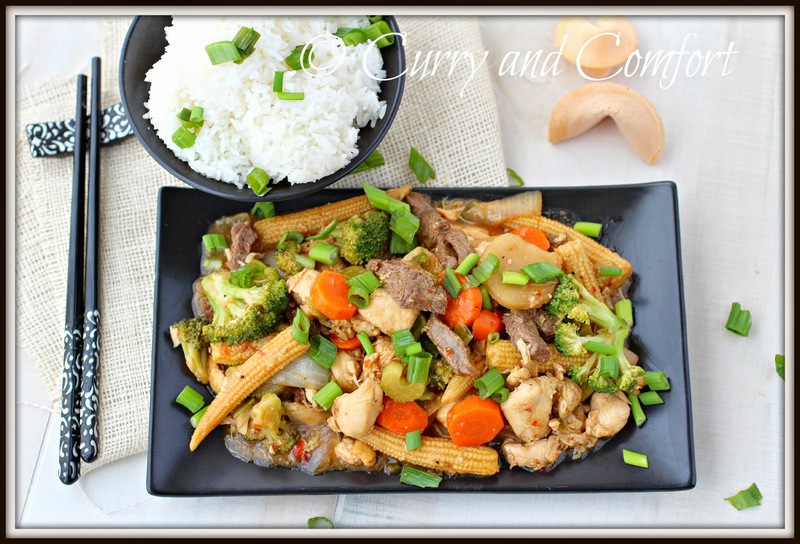 Smart Scoop Ice Cream Scoop-This ice cream scoop did double duty for this stir fry meal. 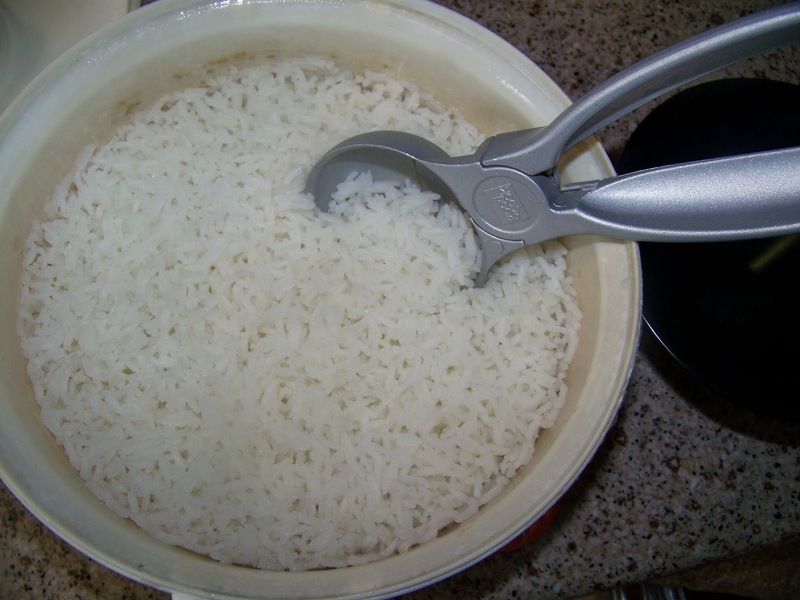 We first used it to make perfect scoops of rice when we served dinner. Then I gave it a quick wash and we finished off the meal with some delicious scoops of ice cream. 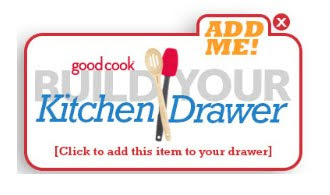 The folks at Good Cook are such givers, you can head over to goodcook.com during the sweepstakes period ( June 2nd through the July 14th) to create your a kitchen drawer filled with the 15 items from Good Cook that you think is ideal for your kitchen drawer. When you are looking for your kitchen drawer items, keep an eye out for the ADD ME icon (shown above) on products to add to your drawer. As a Good Cook Kitchen Expert, I also built a kitchen drawer with 15 of my favorite must have kitchen items. So if you need some help deciding what you want or need in the kitchen make sure to check out my kitchen drawer or any of the other experts items for ideas. Make sure you follow Good Cook on Twitter (@GoodCookcom) and enter to WIN! During the contest, all selected items on goodcook.com will be 25% off, but remember if you enter to win you can get instant prizes as well as additional discounts. I always feel compelled to buy raspberries when I see them on sale because my families loves them. 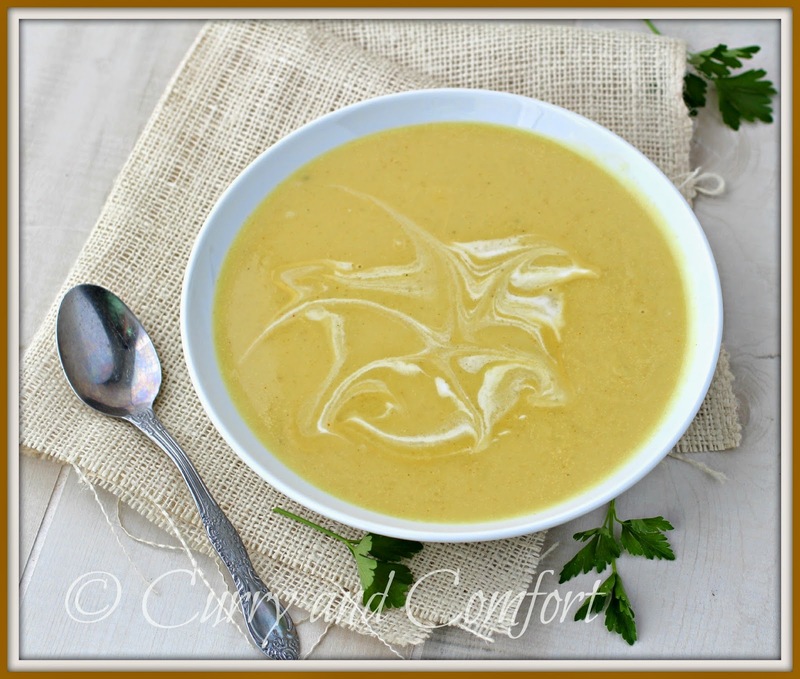 I bought a few extra cartons this time so I thought I would use them in a recipe. I don't know why, but crepes were the first thing that popped in my mind. I don't think I have made crepes since taking French class in High School (and that was a long, long, long time ago). 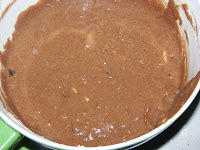 I found a recipe of Alton Brown's (he's always pretty reliable with his recipes) for crepes batter online. 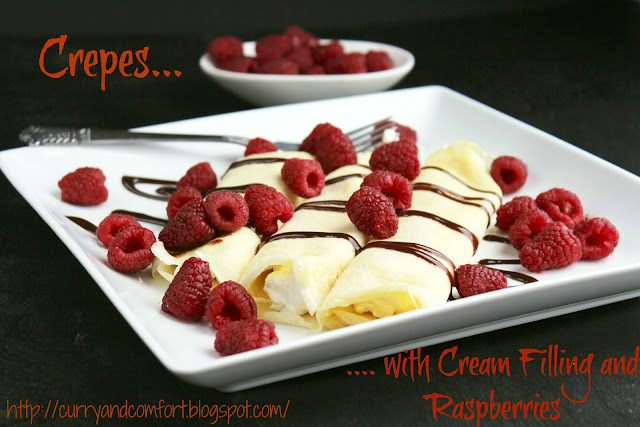 These crepes were quick, easy and worked like magic. My kids were thrilled to bits with these crepes and cleaned me out. I only had half of a crepe left to eat after the feeding frenzy... so much for being the cook. Mix all ingredients for the crepe batter together in a blender. 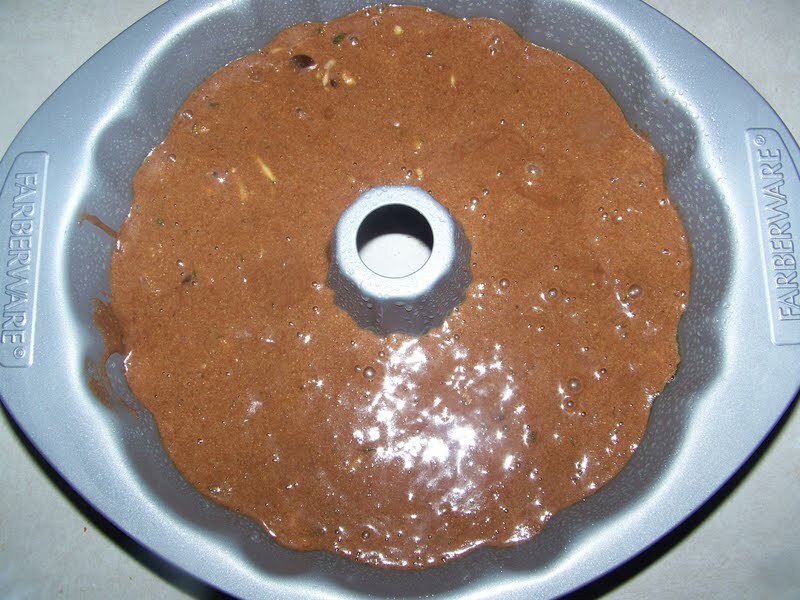 Allow batter to sit in fridge for 1 hour before proceeding. To make the crepes, heat a 8inch nonstick pan on medium heat. 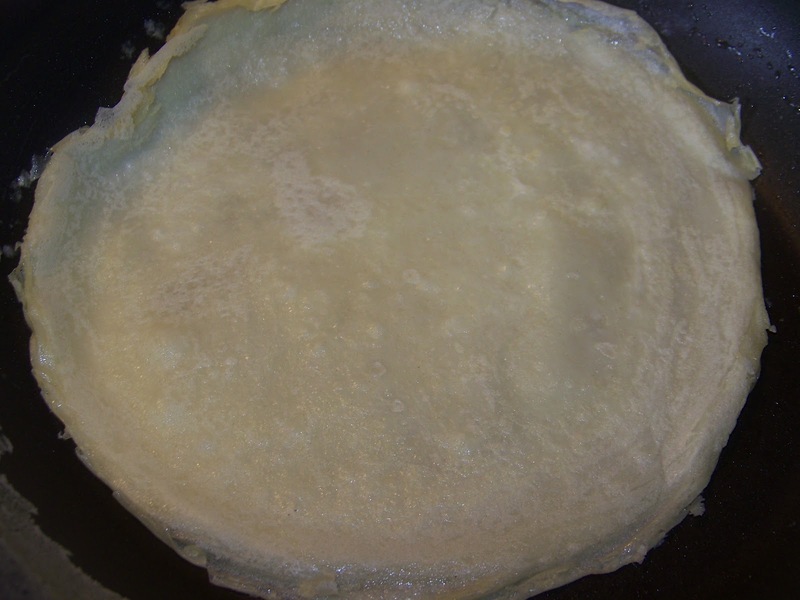 Apply a coating of butter on pan so the crepe will not stick. 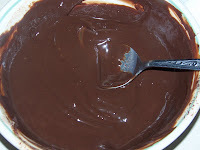 Pour 3-4 Tbs of batter and swirl pan around so the batter covers the bottom the pan in a very thin layer. Allow to cook until the crepe turns opaque and you can flip it over and heat the other side for a few seconds. Note: Apply butter on pan between crepes. Take a wooden spoon or spatula and mix the softened cream cheese and powdered sugar together. Fold in the whip topping and taste for sweetness. Adjust to taste. 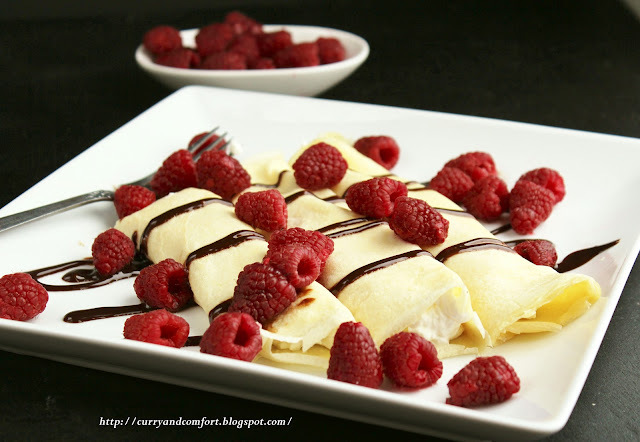 Fill the cooled crepe with a line of filling down the center (be generous). Roll the crepe into a cigar shape and place on plate. 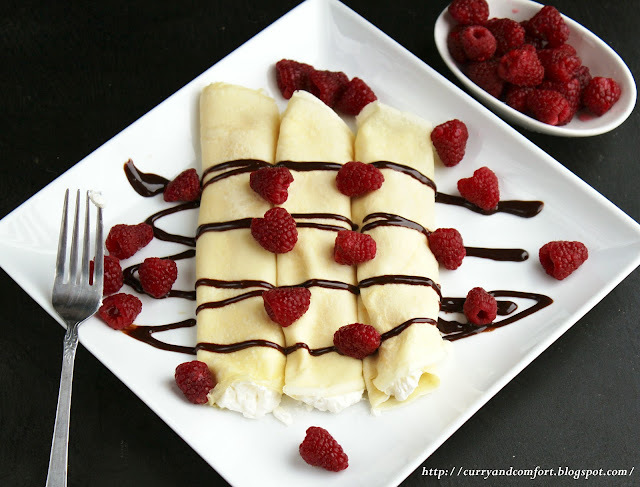 Garnish as you wish with chocolate syrup and berries. Enjoy. As we celebrate this day with our cookouts to start barbecue season... let us not forget to thank and remember the men and women who gave their lives to protect our country and freedom! I am all about kitchen gadgets and utensils that help me out in the kitchen. If I go shopping you will most likely find me drooling in the kitchen/housewares department... never in shoes or clothing. I truly believe having the right kitchen utensils/gadgets can make cooking not only easier, but more fun. Good Cook gave me 5 items to try out in their Kitchen Drawer Event and asked me to come up with a recipe utilizing at least two of them. 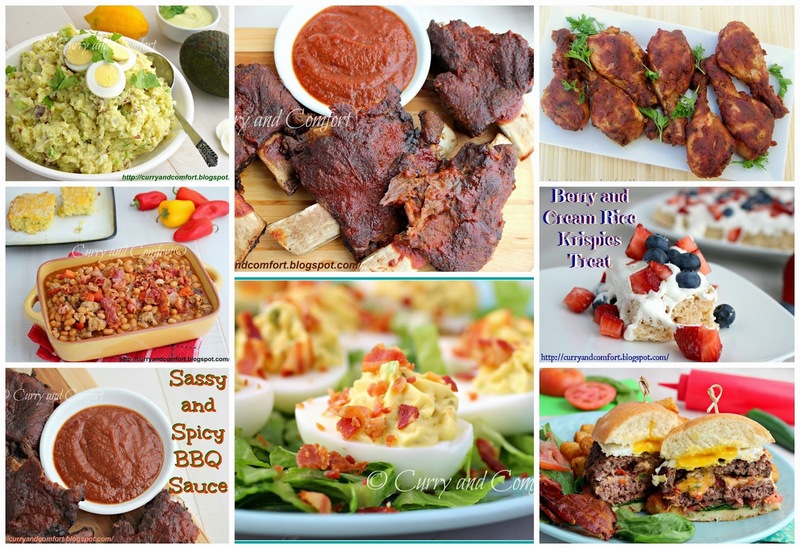 I love a challenge, so I decided to make a recipe that utilized ALL of them. 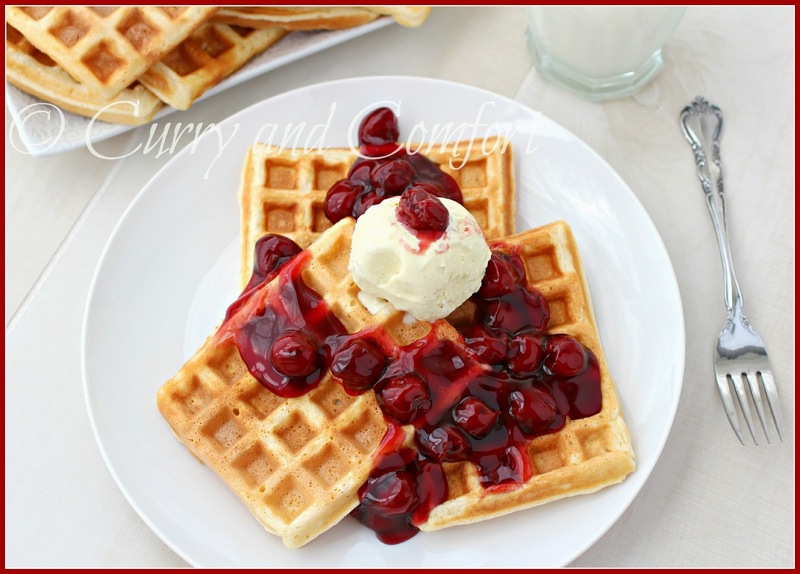 :) I don't make waffles very often at home.. but when I do I want them to be better than any pancake house restaurant. 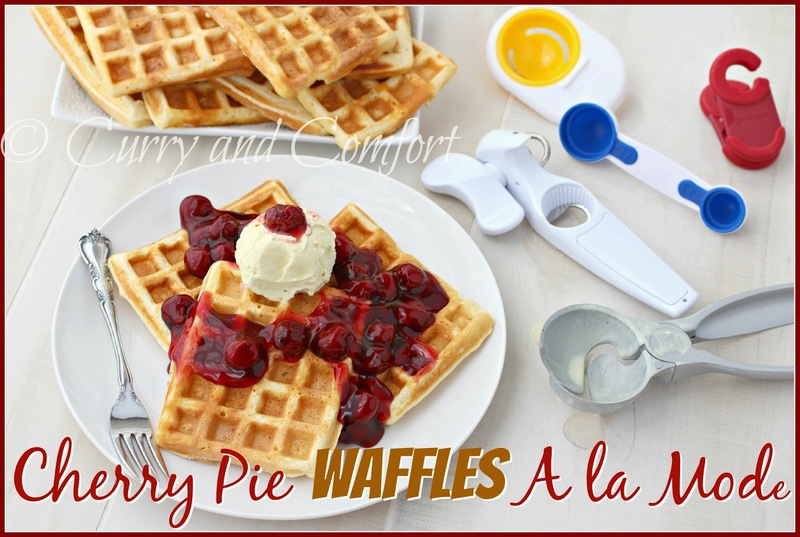 I made these "dessert" waffles and my husband and kids were more than delighted to eat it for breakfast. Ice cream for breakfast... hey... it's not every day... but it's fun once in a while. Remember to check out the Kitchen Drawer Contest information below... you don't want to miss out on this fun opportunity. Measure out and sift all dry ingredients. Place in a bowl until needed. 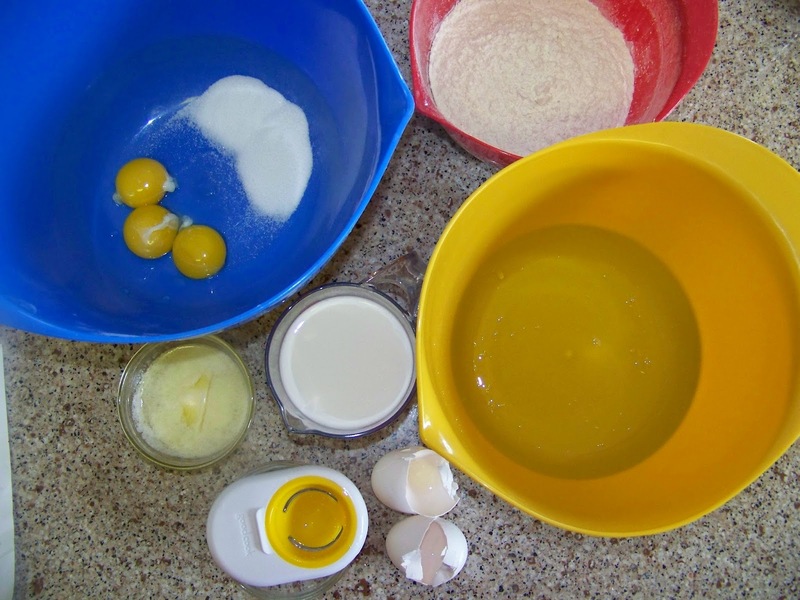 Next separate eggs whites form yolks and place in two different bowls. 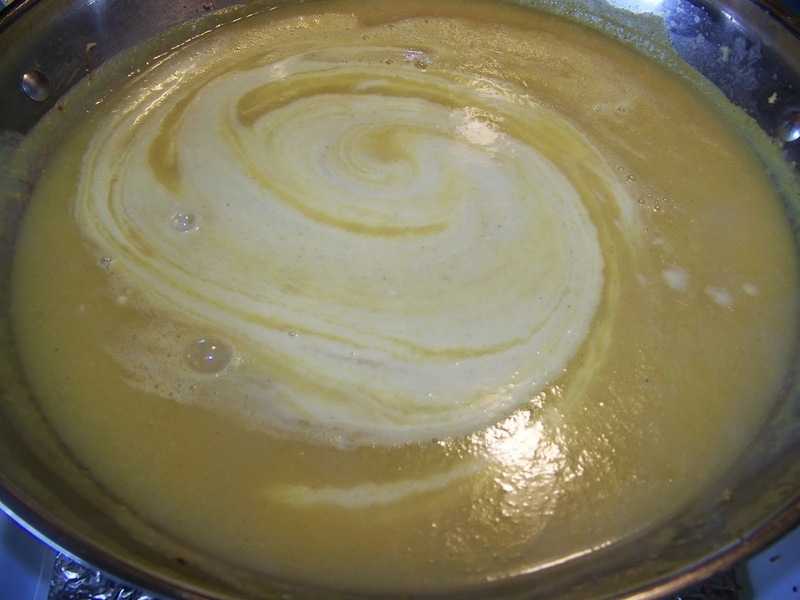 Add milk, sugar and melted butter to egg yolk bowl. 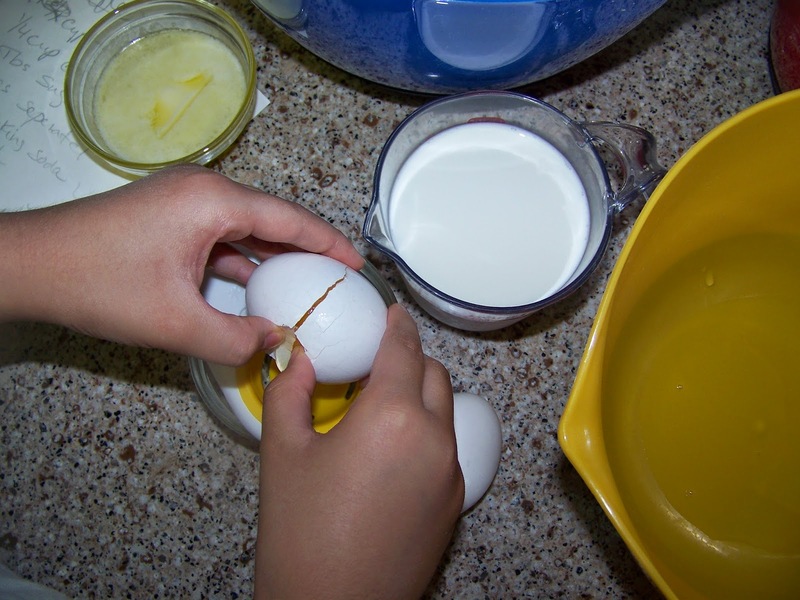 Use an electric mixer to whip the eggs to stiff peaks. Then blend the milk/egg yolk mixture. 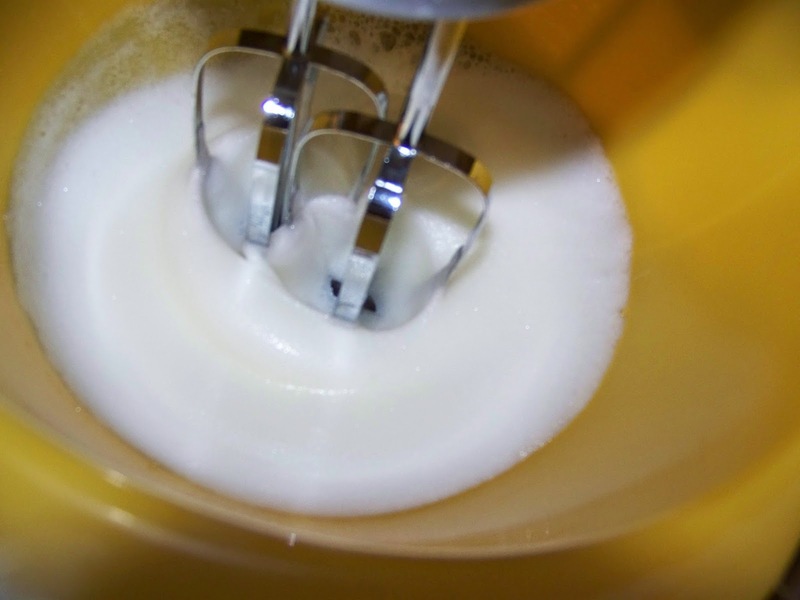 *if using one set of beaters, always use clean beaters to whip the egg whites first. Next mix the dry with the wet ingredients and whisk gently incorporate them together. 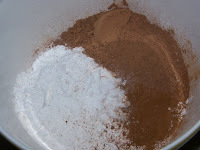 Then add 1/3 of the whipped egg mixture and loosen the batter. Fold in the remaining 2/3 of the whipped egg whites gently. 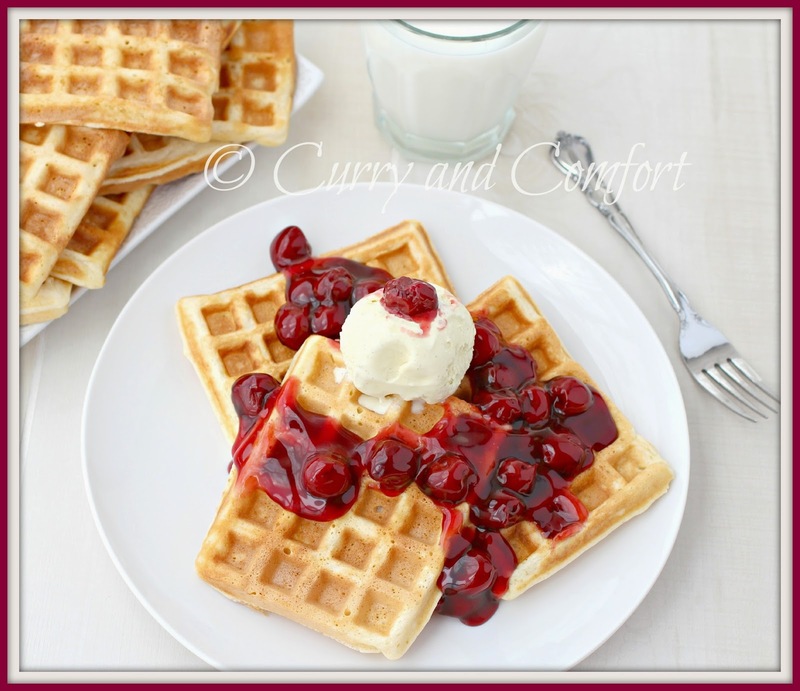 Butter and prepare waffle maker. 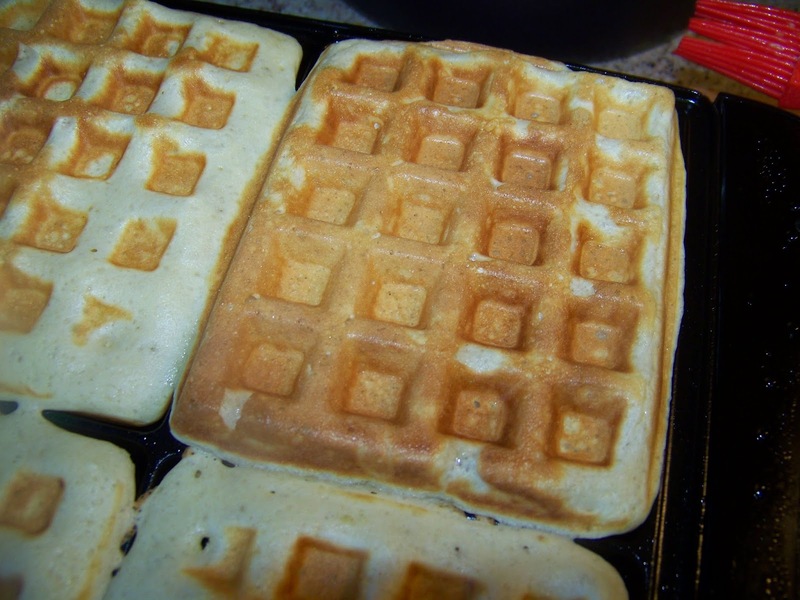 Fill the waffle wells with batter (do not overfill). 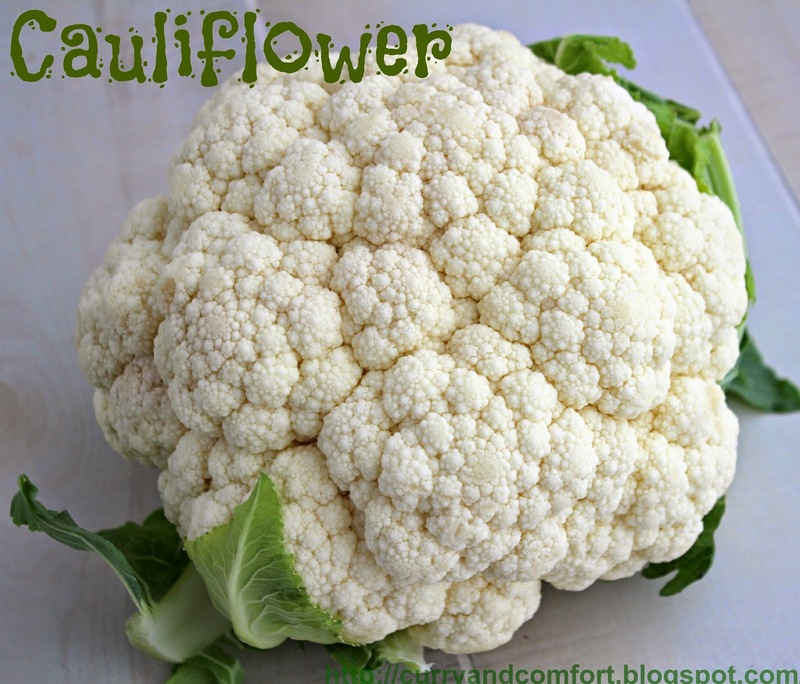 Close and cook for 4-5 minutes or until golden brown. 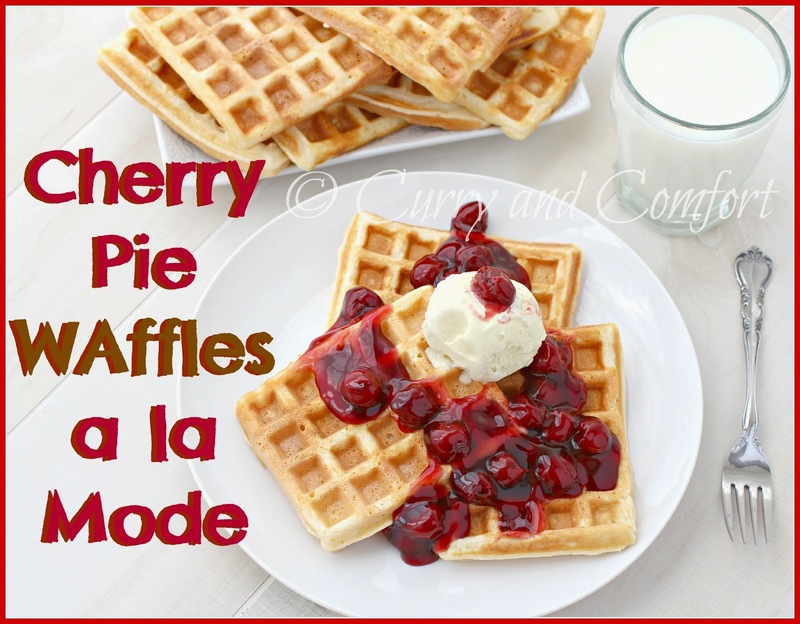 Open canned cherry pie filling and scoop ice cream. Assembly as desired. Eat immediately. Enjoy. 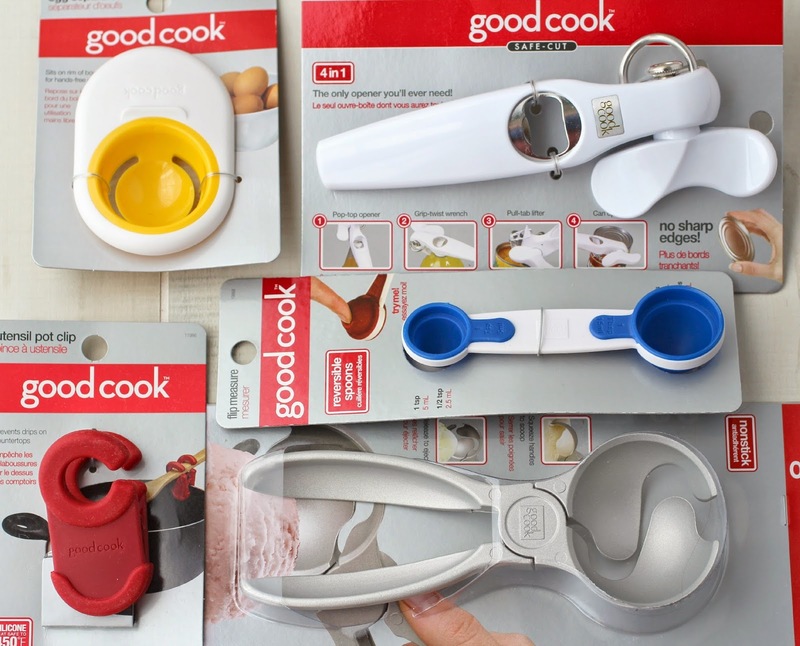 Win these 5 items from Good Cook! 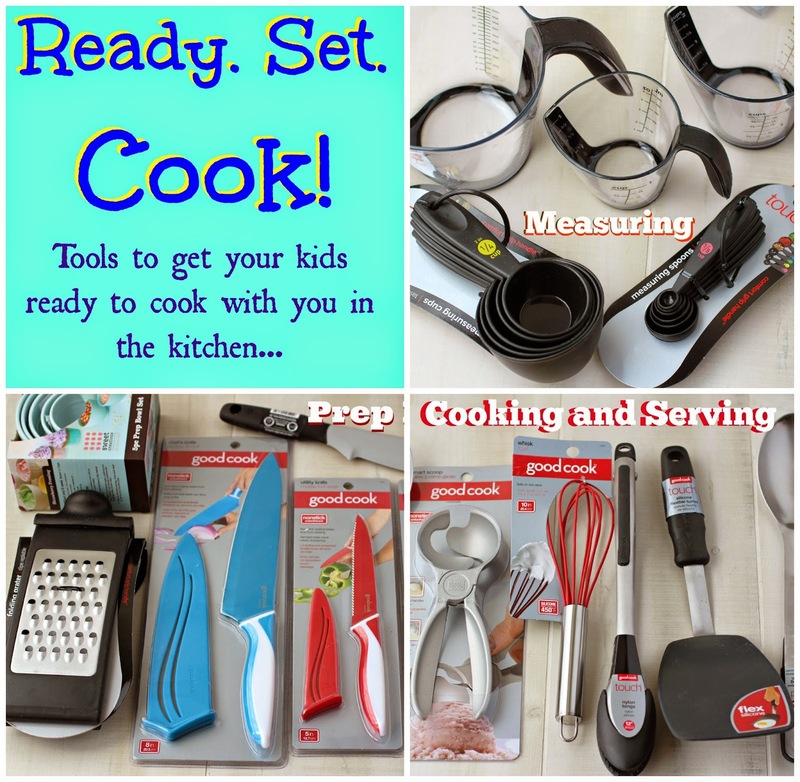 The kitchen tools I shared today are part of Good Cook's featured products for their upcoming Kitchen Drawer Sweepstakes. You can participate in a 5-day product giveaway on Facebook starting June 2 – June 7 and win selected products. There there will be Instant winners! Every drawer entered has a chance to win an instant prize, and participants can submit a new drawer every day for a chance to win. During the contest, everything on goodcook.com will be 25% off, Also follow Good Cook on Twitter (@GoodCookcom) and enter to WIN. Review: This is by far my FAVORITE ice cream scoop ever!! I love how easy it is to use and I even ordered a second scoop as part of my 15 items because we always have 2 flavors of ice creams out at parties. Review: Now this measuring spoon is all about efficiency and convenience. I love how all the spoon measures I use are within one tool so no fussing around my kitchen drawers to find anything. Another plus...since it's one tool... there is less washing to do. That's always a plus for this home cook. Review: I have always wanted a safe-cut style can opener, but I was a little scared of them. I wasn't sure what to expect when I first used this... but I should not have worried. 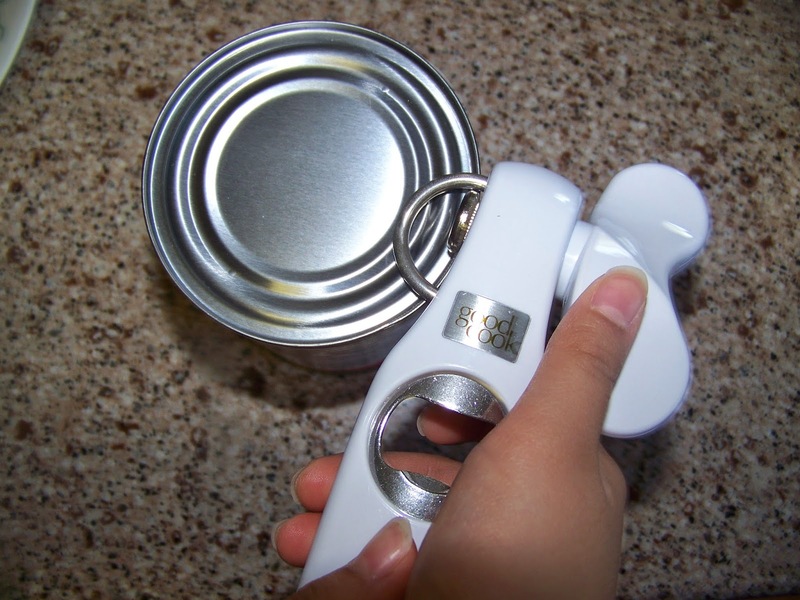 This was such an easy can opener to use, even my kids were able to do it. I also love the other features such as the pop-up can hook. Review: I have to admit, when I see a recipe for separating eggs, I used to turn the page and say "forgetaboutit". 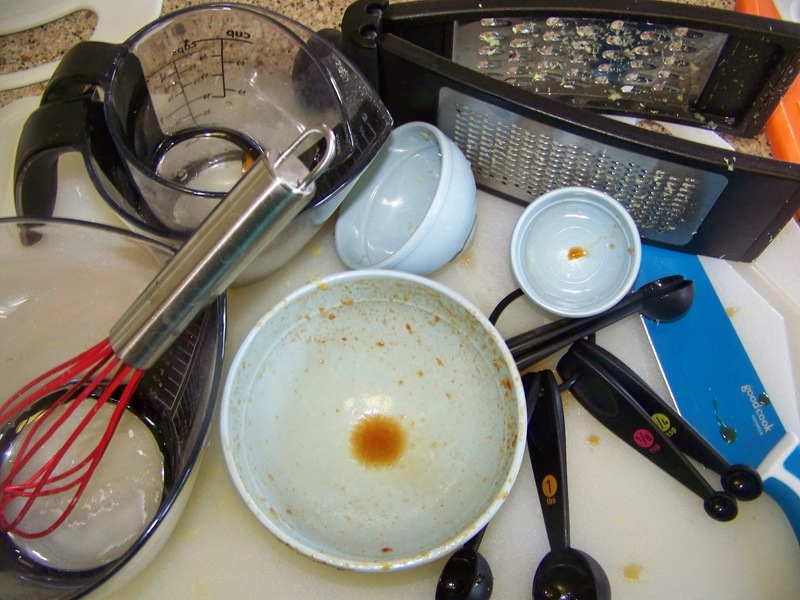 Now with this incredibly easy to use egg separator, it's easy to do and clean up. My daughter helped me use it for this recipe and she can't wait to separate more eggs. Review: I always put my spoon on a spoon rest and it gets terribly messy so I have to clean it with the dishes every day (that means more to clean up). Now with the clip, I can conveniently have my spoon right on the pot without worrying about it falling in or down on the floor. 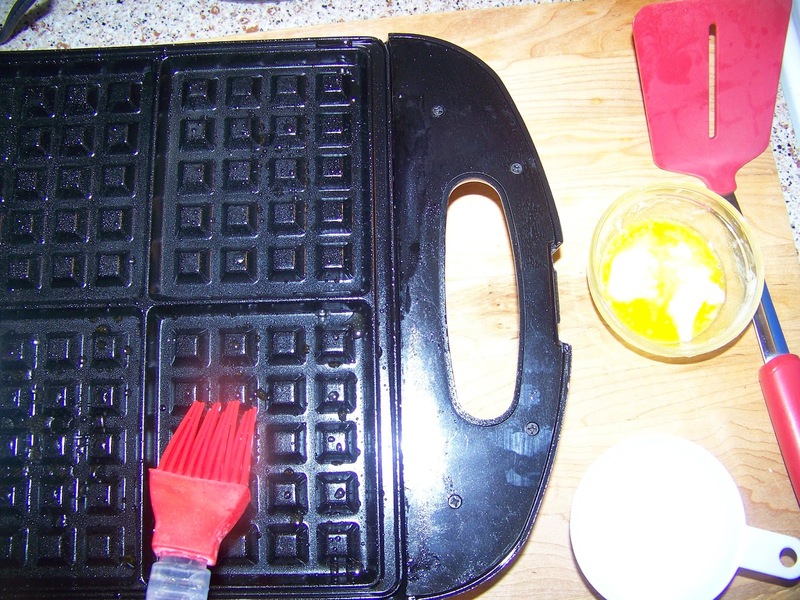 It's not only for pots, I clipped it to my batter bowl so I could keep my batter spoon close by when making my waffles. The folks at Good Cook are such givers, they are not only letting you win the five items I used above, but you can also head over to goodcook.com during the sweepstakes period ( June 2nd through the July 14th) to create your a kitchen drawer filled with the 15 items from Good Cook that you think is ideal for your kitchen drawer.